I know this blog is called "What a Healthy Family Eats", but I want to start off talking about what we drink. In our house, water is the beverage we drink first thing in the morning after brushing our teeth. We sip on it in between meals and during and after exercise. I can't stress enough how important it is to drink water! Too many adults and kids are walking around with symptoms of dehydration. They are tired, constipated, having sinus issues, or feeling sick. And yes, good old water can be a big help. 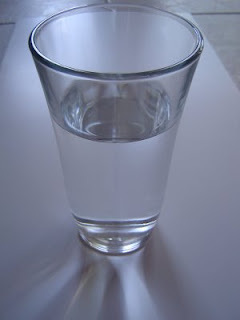 Our bodies are made up of 60% water, so it makes sense to make water and foods containing water a staple in our diets. We drink filtered water. We use a PUR 3 stage filter on our kitchen tap. I know some will argue that reverse osmosis is better because the PUR filter doesn't remove all pollutants...well I'll take 99% as good enough. My concern with reverse osmosis is that all the mineral content is also removed and I don't know that I like the idea of adding minerals back into the water. We also use Sigg Bottles to transport water with us around town. When we forget the Sigg Bottles, I resort to bottled water and usually chose VOSS, Fiji Spring Water or Glaceau Smart Water. It just depends on what I can find and whether we're in a place where glass is okay since the VOSS water comes in a glass bottle. If you are a family that is currently drinking milk, juice or tea most of the day. Think about how you can start substituting water for those beverages. If you are using juice boxes, try switching to a Hanes Juice Flavored Water box or a Wateroo. Instead of serving juice or milk with a snack, serve water. Invest in a Sigg Bottle or other non-leaching recyclable bottle so you don't have to use water boxes or buy bottled water. If you have an athlete in your family they need water, not Gatorade or one of the other colored sports beverages. If they are exercising for more than one hour at a time, then coconut water, HEED, or Emergen-C is a better electrolyte replacement. So just remember this equation: Water 90% of the time, other beverages 10%...unless you are drinking a green smoothie. But I'll save that for my next post!